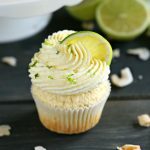 These Dairy-Free Coconut Lime Cupcakes are the perfect summer cupcake recipe with a delicious citrus flavour! Made with no dairy and real coconut! Preheat your oven to 350 and prepare 18 muffin cups with paper liners. Divide the eggs by separating the eggs from the yolks, placing the yolks in one large bowl and the whites in another. Add 1 cup of sugar to the yolks and 1/2 cup sugar to the whites. Whip the egg whites and 1/2 cup sugar until light and fluffy (almost hard peaks), and set aside. To the bowl with the yolks and sugar, add the vegetable oil, coconut milk, and flaked coconut. Whisk these together until smooth and combined. Add the all purpose flour, cornstarch, baking powder, salt and lime zest, and fold the ingredients together using a rubber spatula or wooden spoon until a batter forms. Add the whipped egg whites to the batter, folding them in very gently using a wire whisk or rubber spatula. Divide the batter evenly among the 18 muffin cups and bake for 20-22 minutes at 350 degrees Fahrenheit. Whip the butter on high speed until light and fluffy. Add the lime zest, coconut flavouring, and powdered sugar 1 cup at a time until a soft buttercream frosting forms. Add a splash of coconut milk, if needed, to create the perfect texture for piping. Pipe the frosting on top of the cupcakes after they have cooled completely and garnish with a slice of lime and some lime zest, as well as some extra flaked coconut if desired. Store the cupcakes in an airtight container for up to 2 days.